This page is a fast, user friendly and central location for obtaining copies of the latest versions of CronoSoft software. To download a CronoSoft product, select the product you want to download from the list below or click on info link to read instructions, requirements and other information provided for each product. When it comes to computing, your first concern is performance. Whether it is on the web, on the network, or on your hard drive, solid performance is key to getting the job done. 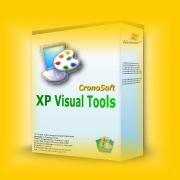 CronoSoft technologies provide you programs that improve your performance. CronoSoft made more dynamic desktop than ever! XP Transparency for use on XP Menu and XP Taskbar, XP Visual Style for renew the aspect of old style programs, XP Logon for managing more easy your XP Logon Screens and XP Wallpaper for randomly change your XP Wallpapers. XP Visual Tools provides fast and easy management\changing of multiple Logon screens and wallpapers, and adding new look and feeling to menu, taskbar and old programs to help your computer come to life! Quick Hide (Quick Hide Windows) serves two purposes. Firstly you can use it as a Boss Key program to instantly hide any non-work activities you may be engaged in during office hours. Secondly you can use it to hide application to free up space on your taskbar or even hide the desktop and taskbar. Day by day our needs grows, we have to manage with more visitors, more hits, more downloads. Because of that we need someone to provide us high-power web hosting solutions, fastest connection possible, 99.9% uptime guarantee, 24/7 technical support! So we choose Vortechhosting and the fact that you are reading this shows you that we've made a good decision! 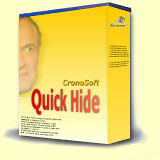 Quick Hide XP Edition is more from CronoSoft. With this special designed software for Windows XP we bring you new features among the old one perfect integrated in Windows XP technologies. You can still hide programs for unwanted eyes or just for making space on your desktop, lock computer and as new features included you can make any window you like transparent or put it on top. All that software product requires 'Visual Basic Runtime' in order to operate. If you do not have these files on your system, you will need to download and install these files. These files are not included with the download of the software product in the interest of reducing download times. Users of Windows 98 or Windows XP and above should not need to download these files, as they are included with the setup of the operating system.